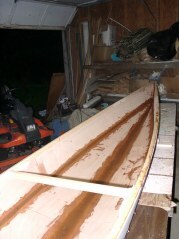 As you can see above, I finally finished all the fillets, so it was time to fiberglass the inside. 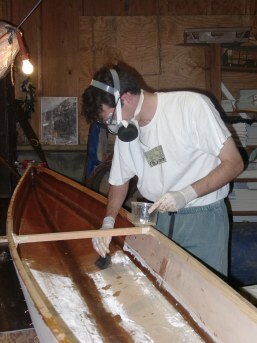 The outside of the hull gets fiberglassed with a big sheet of fiberglass cloth which covers it entirely. The inside, on the other hand, just gets a 3-4 inch wide strip of fiberglass tape down each seam. 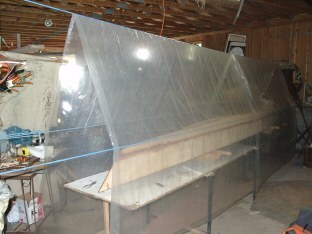 In addition, the bottom panels in the area where the cockpit will be gets fiberglassed with section of a sheet that I cut out before filleting. After laying down the fiberglass and pressing it gently into the fillets (which were still wet), I just painted over it using a disposable brush and unthickened epoxy. I saturated the fiberglass completely but tried not to use more epoxy than needed. Also, I coated the exposed wood on the inside because the epoxy acts as a sealant.